Apple's expansion in Mac enterprise sales to large corporate customers has greatly accelerated with the arrival of mobile iOS devices. But there's also new interest emerging for Apple TV's tvOS platform among enterprise buyers. Despite commonly being thought of as just a home video streaming box, Apple TV also serves as an easy-to-manage app platform for digital signage and wireless streaming for corporate presentation rooms and in healthcare and hospitality. 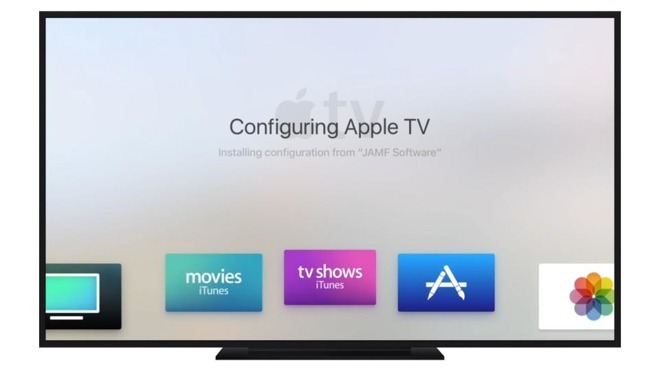 After a new Apple TV is plugged in, can be automatically configured and remotely managed using the same software as Macs and iOS devices, making it easy to roll out digital signage in public areas and cafeterias and provide conference rooms with support for easy to use, wireless AirPlay video streaming as well as custom apps for delivering messaging and information to employees. The security and management tools designed into Apple TV have no comparison among other TV set top boxes oriented toward replacing cable-based TV entertainment, including Amazon Fire TV, Chromecast, Roku or other "smart" systems built into televisions. Apple's tvOS, introduced with last year's Apple TV 4, also provides a familiar development platform for custom corporate apps, in addition to consumer shopping titles, subscription video streaming channels and games. Lang described efforts to deliver internal Apple TV apps at SAP to display custom content, such as advertising company success stories on video displays around corporate facilities. In a JNUC presentation on using Apple TV in hospitality, speakers Hironori Fukuda of Too Corporation and Yuichi Takahashi of Change Inc. outlined the reasons for deploying Apple's tvOS platform at a guest hotel in Japan, in preference to a conventional Video On Demand service. Installing Apple TV costs less than typical VOD subscriptions, and can deliver access to users' own content, allowing them to log into their personal Apple Music, iTunes and Netflix accounts, for example. VOD content is both more limited in scope and more expensive for the hotel to provide. Apple TV provides access to a range of English-language content for guests, and is more familiar to younger audiences than other offerings targeted toward the hospitality industry. Additionally, Apple TV units can be managed centrally using the same software used to manage enterprise iOS devices and Macs. And conceptually, if installed on the same network as WiFi routers, Apple TV can offer AirPlay streaming to guests to allow them to view their personal iPhone content, including photos and videos, on in-room TVs. One year ago this month, the University of California, San Diego opened its new, digitally savvy Jacobs Medical Center. The facility has 245 patient rooms, each outfitted with both an iPad and Apple TV that are customized for each patient during their stay, centrally managed using Jamf Pro software. The equipment allows patients to securely view their medical records and review the schedule of their prescribed medications using the MyChart Bedside iOS app from Epic (UCSD's electronic health record system) as well as acting as a way to call a nurse, play games, watch videos and connect with family and friends via social media apps. Additionally, the managed devices enable a patient to control the room's blinds, lighting and temperature. Using device management, an iPad can be configured specific to the room it occupies, so it only works within that room. When the patient is discharged, all of their personal and private information is securely wiped and the device can be prepared for the next occupant. This year, James Rafel of Geisinger Health Systems outlined a similar patient bedside initiative that provides 357 iPads and Apple TVs for 100 patient rooms, with across 24 departments in six care facilities. Patients at the facility can login with their own Apple IDs to access their personal content. And while patients can call for assistance from their bedside iPad, Geisinger saw decrease in call bells, resulting from patients being involved with their iPad and able to do more on their own without assistance.